It made me travel to the Caucasus and record this video. In this 4,5 min short video I compare how natural climate change many thousand of years ago, forced humans to migrate across the Caucasus. Now people around the world migrate because of human impact on the climate. We must quickly switch to solar energy. The technology exists. We now also have the technology to extract carbon dioxide from the atmosphere. If politicians dare, we can prevent the apocalyptic disaster, but we must be prepared to reduce our standard of living, and we must act quickly. Please share this video. Many, many people do not know how alarming the situation is. Soon Arctic will be ice-free during summer! 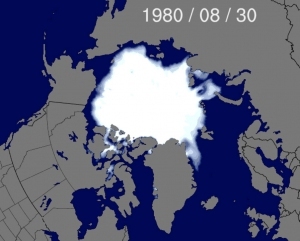 NASA animation showing Arctic see ice 1985-2016. 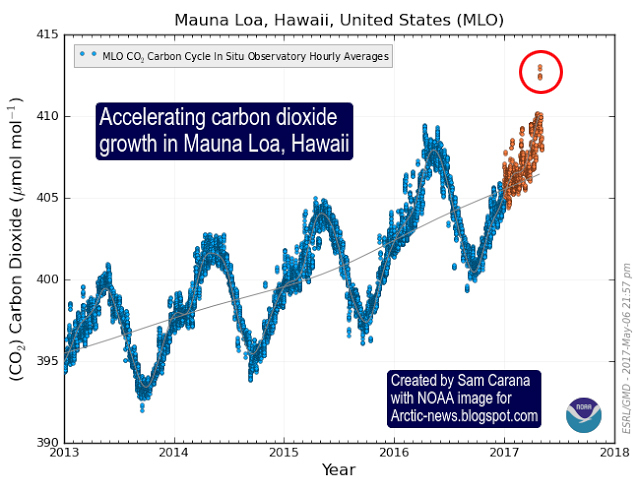 The red circle marks the suddenly increased amount of carbon dioxide in the atmosphere over the monitoring station in Hawaii April 2017. During this time-frame human society developed. 2 degrees lower or higher temperature means disaster. The global temperature increase was in May 2017 just over 1 degree. If anyone in 70 years’ time can read this, it means that humanity has managed to come to its senses, and in a desperate battle for survival has managed to master the forces of Nature. Nature’s revenge on the depredations of Mankind was, in fact, already written on the wall when scientists in the 2010s realized that everything pointed straight to perdition. “Even with a deal to stop the current rate of greenhouse gas emissions, scientists warn, the world will become increasingly unpleasant. Without a deal, they say, the world could eventually become uninhabitable for humans” (New York Times 2014-11-30). “We have some very grave information to share about the Arctic Methane Emergency … We are now faced with the choice between life on Earth and money” (Lima Cop20). The global warming that has occurred as a result of burning fossil fuels had uncovered an even more serious immediate threat: methane gas. This gas is more than 150 times more potent than carbon dioxide, and a huge amount was being released into the earth’s atmosphere from the East Siberian Arctic Shelf (ESAS). 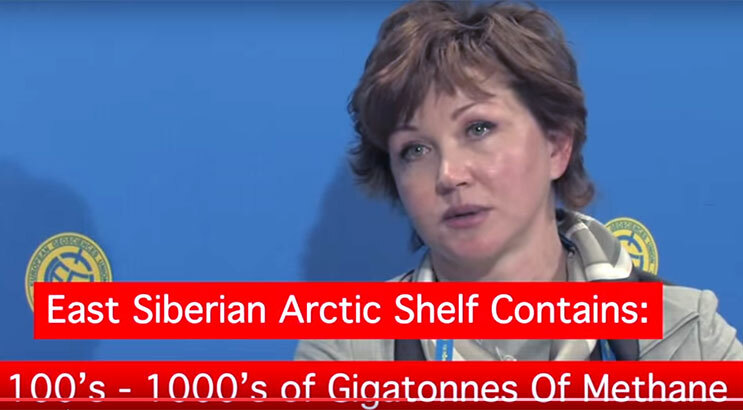 Dr. Nathalia Shakova warned that between 100-1000 gigatonnes of methane were tied in ESAS tundra just 50 meters below sea level, and that up to 50 gigatons were about to be released, according to her research findings. “The whole zone of the Siberian Sea is now releasing all of its methane content… Nasty things will happen already at +2°C [and] a rise of 4°C means the end of our civilization … It would mean social and economic disaster for our planet … The big methane emissions would also advance the disaster by [conservative count] about 20 years, to within 50-60 years.” (Lima Cop20). Researchers from Stockholm University have since 2011 conducted several expeditions to the East Siberian Arctic Shelf. Professor Örjan Gustafsson Chief Scientist (Stockholm University) reported from the Swedish Arctic SWERUS-C3 expedition 2014 of vast methane plumes escaping from the seafloor of the Laptev continental slope. ”SWERUS-C3** researchers have on earlier expeditions documented extensive venting of methane from the subsea permafrost system to the atmosphere over the East Siberian Arctic Shelf,” writes Örjan Gustafsson. He continues: ”Carbon reservoirs inside the Arctic permafrost are sometimes referred to as the “sleeping giants” of the global carbon cycle. If these reservoirs were released due to global warming, it could lead to large emissions of the greenhouse gases carbon dioxide and methane to the atmosphere, which, in turn, would lead to further warming. If this were to happen, the worst climate scenarios predicted by the Intergovernmental Panel for Climate Change (IPCC) could materialise. The possibility of such scenarios forms the basis of the Paris Climate Treaty… The new study gives an indication of what we can expect with the ongoing climate warming and makes it even more urgent for us to quickly adapt into a fossil-free society and to adopt a sustainable economic system to avoid the serious consequences that climate destruction could bring,” says Örjan Gustafsson … It has recently been documented that a tongue of relatively varm Atlantic water, with a core at depths of 200–600 m may have warmed up some in recent years. As this Atlantic water, the last remnants of the Gulf Stream, propagates eastward along the upper slope of the East Siberian margin, our SWERUS-C3 program is hypothesizing that this heating may lead to destabilization of upper portion of the slope methane hydrates. This may be what we now for the first time are observing” (SU). 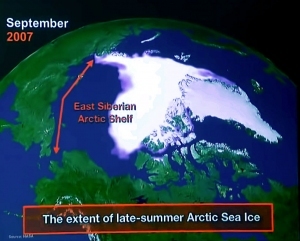 A study in Science 2010 and Nature 2012 showed that methane actually was released into the atmosphere from over half of the huge area formed by the East Siberian Arctic Shelf (about 4 times the size of Sweden)… Uncertainties remained regarding how much of the mobilized old country-coal was mined into the sea (and thus was emitted to the atmosphere as carbon dioxide, a strengthening of the greenhouse effect) versus how much was buried in the seabed (and thus did not lead to increased levels of greenhouse gases in the atmosphere)” (ibid). ** SWERUS-C3 is a multi-disciplinary program with base funding supported from by the Swedish Knut and Alice Wallenberg Foundation (KAW) aiming to investigate the linkages between Climate, Cryosphere (here: sea ice and coastal permafrost) and Carbon release from the sediment, with addition of greenhouse gases (GHG) to the atmosphere. SWERUS-C3 includes principal investigators from Stockholm University, University of Gothenburg, Pacific Oceanological Institute, P.P. Shirshov Institute of Oceanology, Russian Academy of Sciences (RAS), National Tomsk Research Polytechnic University, the International Arctic Research Center (IARC) at University of Alaska, Center for Coastal and Ocean Mapping at University of New Hampshire and Rice University. ”We can show that already today this CH4 [methane] from deep, old reservoirs migrates through the thawing permafrost towards the seafloor … The very shallow depth of the ESAS allows a short path for these bubbles to reach the atmosphere … No quantitative estimate of this CH4 source is to date possible, but a rise in temperature will enhance microbial formation and permafrost thawing, hence emissions of biogenic CH4 from the deep subsea permafrost of ESAS are expected to play an increasingly important role for the radiative force of the Earth in the future”. The melting of sea ice in ESAS started as a result of the increase in global carbon dioxide (CO2) emissions, which in turn has resulted in an unprecedentedly rapid temperature increase, especially in the Arctic region. (NOAA). 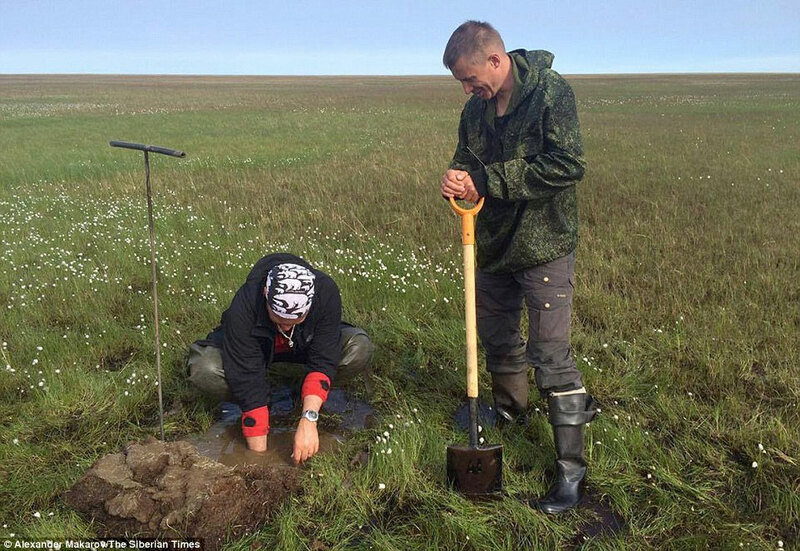 In July 2016 the Daily Mail quoted Russian scientists who discovered holes on Belvy Island in the Kara Sea. These holes emit methane gas 200 times more than normal and 20 times more carbon dioxide than normal. Dr. Sokolov, from the Ural Department, Russian Academy of Sciences, said that he saw this phenomenon (Picture) first during an expedition in Siberia in 2015. “I have been working in Yamal for twenty years now – some of my peers have been working here even longer – and this is the first time I have ever seen this,”. South of Belvy Island is another phenomenon closely observed by researchers: the sudden formation of craters, generated by methane gas explosions under the surface of ice which has melted. 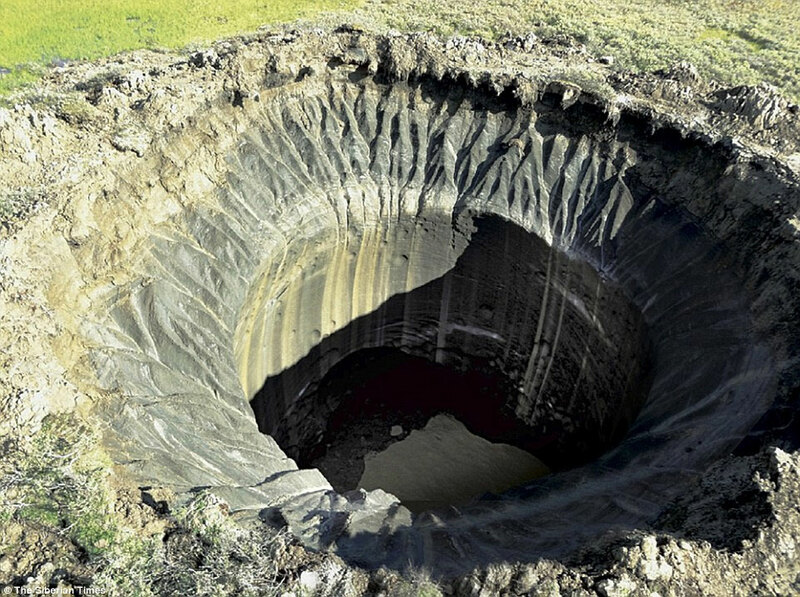 These Siberian craters (below) are believed to have been caused by the release of gas previously frozen in the permafrost. 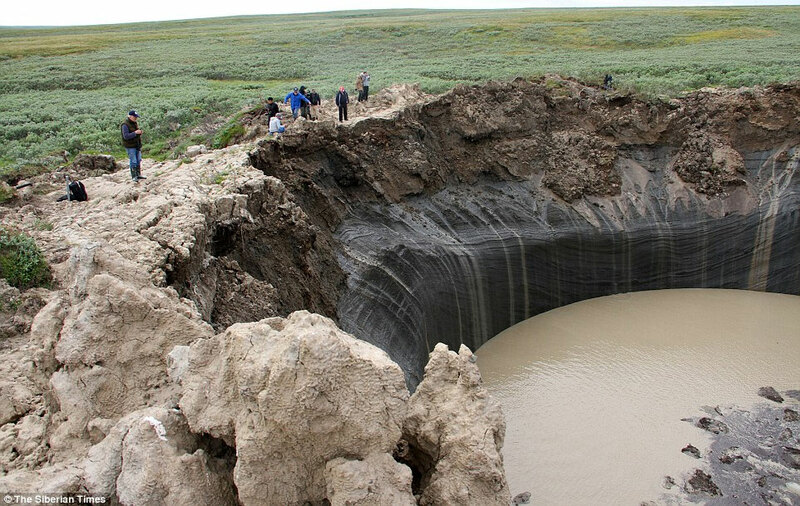 The Yamal craters, some tiny but others large, were created by natural gas filling vacant space in ice humps, eventually triggering eruptions, according to leading authority Professor Vasily Bogoyavlensky, of Moscow’s Oil and Gas Research Institute. The figure below shows the land and sea temperature increase during the month of March 2017. 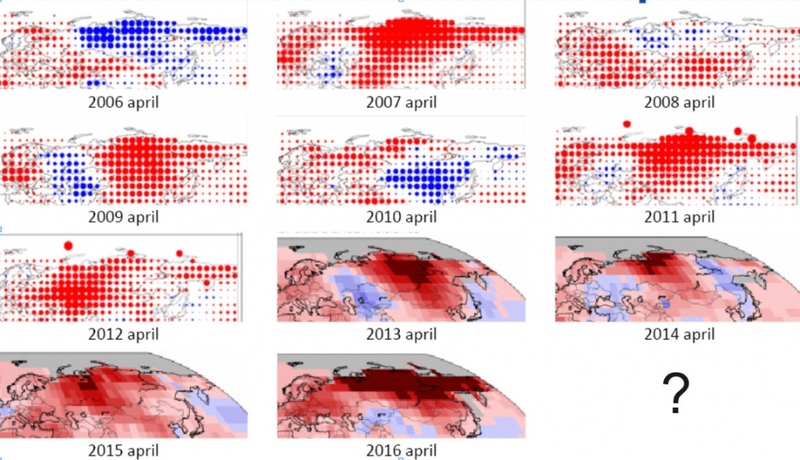 Note the continued record heat in northern Siberia and especially on ESAS, which was very ominous, given the amount of methane released there when the sea ice melted, and also exposed low level methane-intensive areas in the tundra (NOAA 2017-04-13). “We are on the path where earth was, 4-5 million years ago when the sea level was many feet higher and very little ice was left in the arctic”, said Dr. Jennifer Francis during the Weather and Climate Summit 2016-01-21. Increased ice melting also increases the amount of water in the atmosphere, which in itself is a factor of the greenhouse effect, and also creates more violent storms and increased precipitation. The increase in the melting of ice was 2-3 times higher, as a consequence of the loss of white reflective ice cover, giving to an exponential effect of temperature rise. At the same time, however, a strengthened southern jet stream was observed, and weather pattern remained largely unaffected by the increase in northern atmospheric CO2. 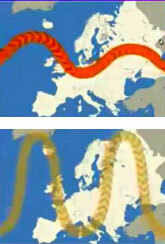 Another decisive factor was the change in the jet stream. Global warming meant that the jet stream weakened and slowed down, causing cold air from the north pole to reach far more southerly latitudes than before, which led to the very cold and snowy winters in the United States in 2014 and 2015. 2017 was however almost snow-free in both New York and Chicago, as a result of the changed jet stream enabling warmer air to flow up from the south. The slower jet stream also gave the result that weather fluctuations lasted over a longer period, said Dr. Jennifer Francis during the Weather and Climate Summit 2016-01-21. “There is an almost straight north wind of polar air. A good dose of cold air continues to flow south “(AB). But there was great uncertainty as to when the end would begin to be felt. 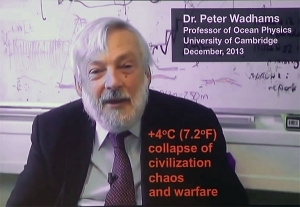 In 2017 Professor Emeritus John E. Walsh* claimed that the world seems to have abandoned the goal of stopping at a +2°C rise, and scientists are focusing instead on a scenario they call the RCP 8.5, which is a measure of how many extra watts per square meter reach the earth’s surface due to human impact and natural CO2 and CH4 emissions (Keeling lecture 2017-04-24). 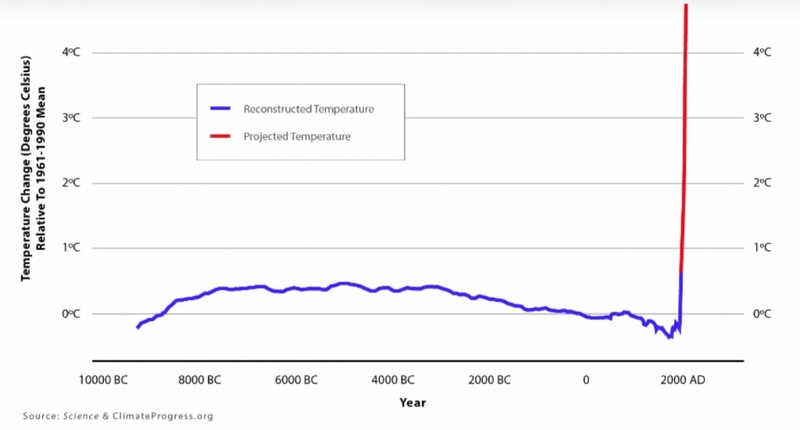 Never before in the history of the Earth, has the global temperature increase been as high and as fast. 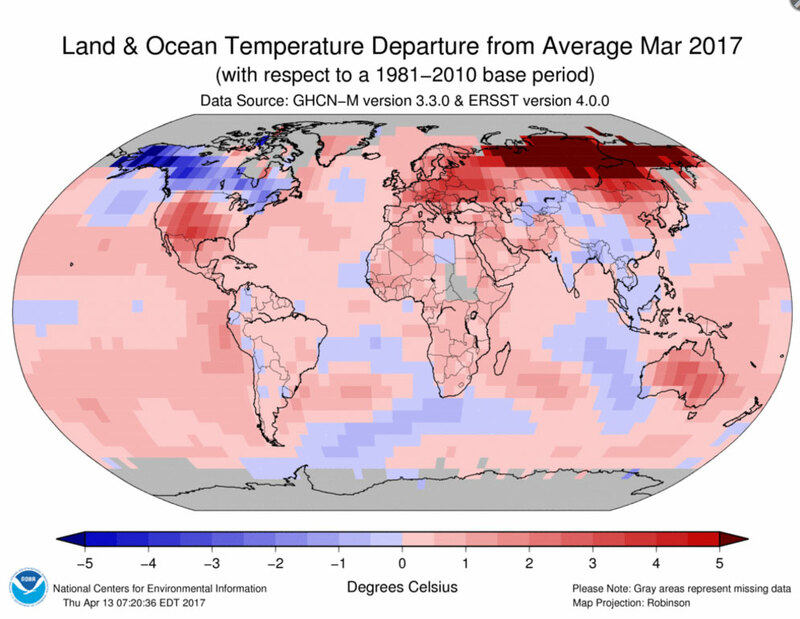 2016 was the warmest year since records began. CO2 content was 410 ppm (parts per million) and accounted for a lower threat than CH4. Methane from thawing permafrost areas increased warming exponentially. 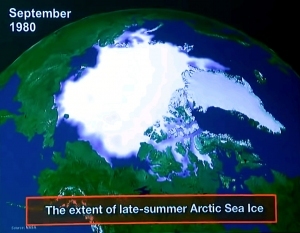 The temperature increase in the Arctic was 2-3 times higher than in other places on earth. CH4 in the atmosphere was 1840 ppb in 2016, more than 10 times over the results before 2014, when the methane gas only rose by about 0.5 ppb / year. Before industrialization the number was 700 ppb (parts per billion). 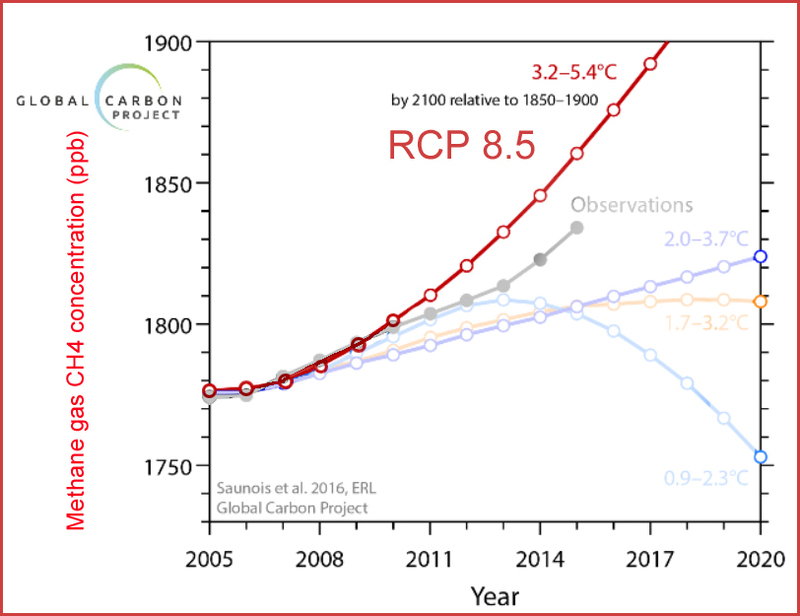 The recent increase of CH4 in the atmosphere is approaching the RCP8.5 scenario. 50 gigatons emission of methane gas into the atmosphere from ESAS could mean that the current level of 400 ppm increases to 800-1000 ppm, which civilization can not survive. ESAS is the largest continental shelf in the world. 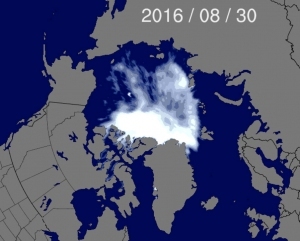 Arctic sea ice could be gone by September 2017. The lifetime of CH4 in the atmosphere is 9 ±2 years, which may possibly mitigate it effect on the climate if only humanity survives the critical period. The sea level at the beginning of 2017 was 0.85 cm higher than 1993. Mankind had, according to Professor Peter Wadhams at the most 60 years to ensure continued existence. Others thought that the time span was much shorter because the process already had started with greenhouse gases already released. I was afraid to write this article. I do not want to scare anyone, but the fact is that humanity is facing a disaster, and if we want to continue to live, surrounded by life-giving Nature, we must change our way of life. We have to live with respect for nature, for it is Nature that is our sovereign, and not vice versa. Planet Earth has simply too large a population. 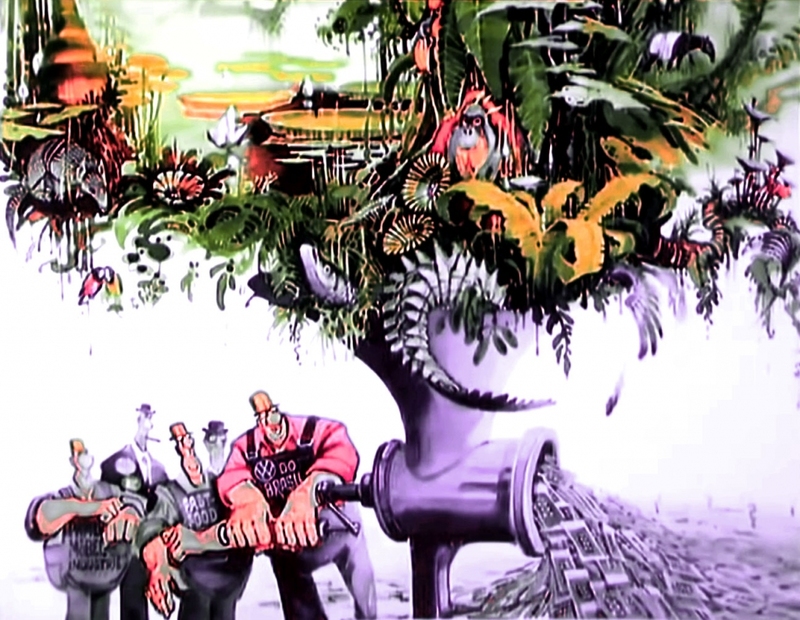 Above all, it is populated by too many greedy people in decision-making positions, backed by a general worship of money and a world economy that is dependent on the ever-increasing production and consumption of superfluous luxuries. Some of you may have read my book “EVOLUTIONARY ideas – A short story about why, when and how humans (by all accounts) took the wrong path and almost killed the planet”, in which I warn of the imbalance of Mankind that has resulted from the dominance of men over women. By giving women the power they had until about 4300 years ago, fewer children will be born, for women in decision-making positions have fewer children; and with female and male in harmony, we can save the Earth for future generations. ”Women are giving birth to more children because of faith based issues … When women are empowered, the birth rate goes down. That is statistically proven”. With huge investments in solar, wind and tidal energy and solar-powered cars and lorries, we can relatively quickly remove much of the man-made CO2 emissions. This, together with pioneering technologies in transport and industry can reverse the Earth’s catastrophic global warming. We must re-freeze the poles through significantly reduced CO2 emissions and find a way to stop arctic CH4 emissions. Humans have shown that we can unite, as during the Rosetta project, when scientists from 21 countries worked together to achieve what seemed impossible. 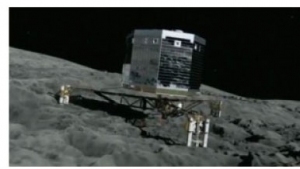 The successful mission of the Philae probe on November 12, 2014, towards a comet 500 million kilometers from Earth (Picture) was an outstanding achievement for Mankind. Yet in the ten years that the spacecraft was on its way, millions of people were murdered people blinded by superstitions backed by religious or ideological decrees to kill all dissidents. 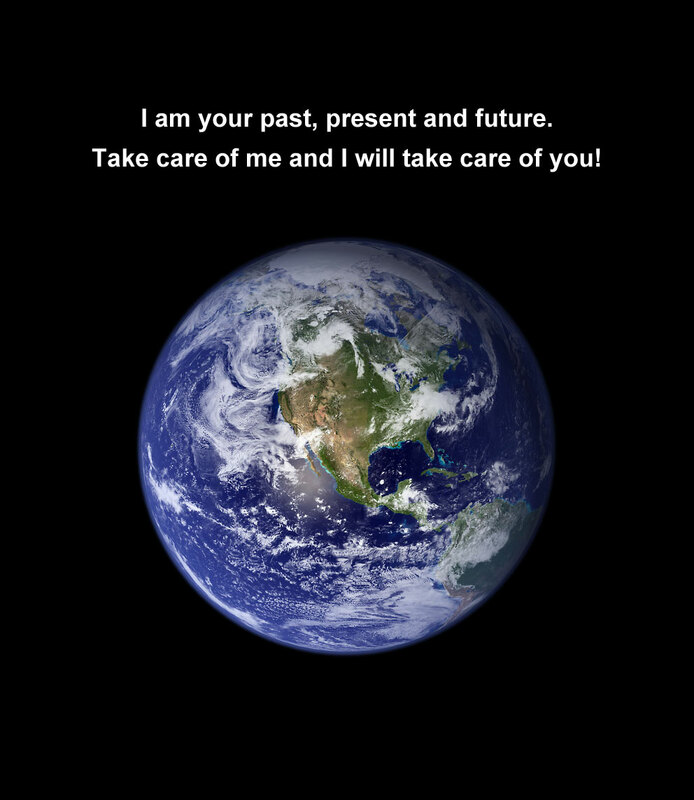 Our civilization and Planet Earth’s future require that we focus on solving existential problems together. Superstitious fantasies must, therefore, be relegated to history’s junk shelf, where they will be seen as a cautionary example of how dangerous it is when stories displace reason.